Have you ever wondered that, if Marcel Duchamp were alive today and chose to create comics instead of buying urinals, what kind of comics would they be? Strangely enough, the answer to the question above did in fact come to me as I waded through the sea of hilarious and impenetrable absurdity that is Michael Kupperman’s “Tales Designed To Thrizzle.“ Duchamp’s comics would read just like this. The characters Kupperman creates in his stories (most of which are only a few pages or less long, creating constantly shifting subject matter) are in a constant, unending state of meta: they are completely unaware of the utterly surreal and absurd nature of the settings they are in. This is accomplished by the fact that no matter how weird the situation, everything is told with a straight face. It’s like the Bizzaro world except there aren’t any “normal” real world people visiting to tell its inhabitants how bizarre they really are. “Tales Designed To Thrizzle” is a comic that is guaranteed to have more “what the f__k?” moments than anything else on the store shelves. Don’t believe me? Then consider the thrilling (?) adventures of “The Mannister,” a hero whose sole superpower is the ability to turn himself into a stairway banister. Or the crime fighting team of “Twain and Einstein” whose tales can involve Starsky and Hutch style action, making out with robots or hugging police sergeants from beyond the grave. 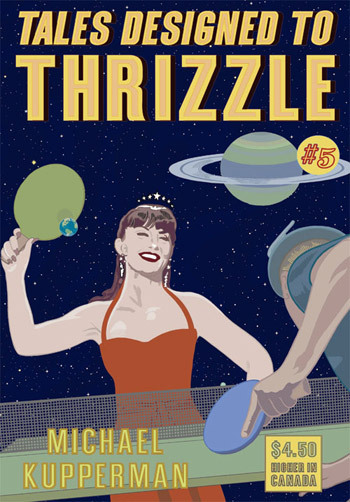 The art of “Thrizzle” is as hard to place any kind of definitive classification on as the stories they accompany. Though much of the artistic content of any given issue is identifiable as distinctly Kupperman’s, he can just as easily slip into other styles as well, anything from E.C. horror and 1930’s advertising to early super-heroics and moody noir. The new issue hitting the comic shops is #5 (published by Fantagraphics) and comes strongly recommended. This particular type of humor may not be for everyone, but if you love Monty Python or own records by Firesign Theatre you may have just found your new favorite comic book.